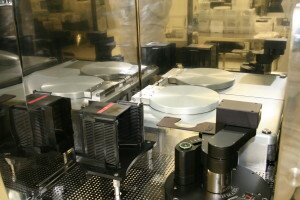 It is possible to deposit on different dies/parts if they can be placed on a machined Al plate of the same size as wafers. Some height restrictions apply. PECVD (plasma enhanced chemical vapour deposition) by ICP (inductively coupled plasma) of SiO2, Si3N4 and amorphous Si.Carrier gas like O2, N2 or Ar is let in to the ICP reactor. The ICP makes the plasma denser than ordinary PECVD and makes the dissociation of more effective, allowing lower deposition temperatures. SiH4 is used as the carrier for Si and is injected in a separate gas ring closer to the substrate. The ICP configuration allows for separate adjustment of plasma power and substrate bias. Temperature control of the wafer is by He overpressure on the back side. If there are holes in the wafer, the process uniformity and deposition quality will differ. Max deposition temperature 280°C, typical 200°C. SiO2 can be deposited down to 100°C. Step coverage is not very good and must be verified for demanding projects. NH3 is available as a carrier for nitrogen in process development. The outer 4mm is covered by a clamp ring holding the wafer in place.